Stash your cash with Loony Bingo's New Offer | Play with £80! It's December, a new month and the holidays are coming! So get into the festive spirit with Loony Bingo‘s brand new Welcome Offer! Loony Bingo has launched a brand new insane Welcome Bonus bundle that will have you jumping for joy! What better way to distract yourself from the freezing weather and dark nights than to get into the holiday spirit! 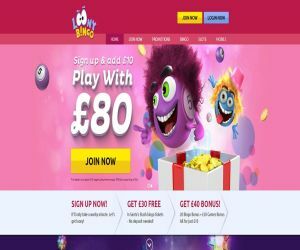 As part of the new wacky welcome bundle, all you have to do is sign up to Loony Bingo and top up your account with just £10. Then you can start exploring the loony bin with a super cool £70 bonus! The bundle is broken down into three parts. So you can enjoy £30 worth of cards to try and stash your cash with the festive ‘Santa Stash’ Jackpot game! You can also pick up an insane £20 Bingo Bonus and £20 Games Bonus to test out some of the hottest games and see how much you can win for Free! Since it is the season to be merry, you can also take advantage Loony's other sizzling offers. This includes cashback, wacky bonuses and insane jackpots like the daily grand, payday £10K jackpot,and progressive slot jackpots. You could even spin your fortune with the Self-Made Millionaire £1m jackpot and find more exclusive offers in the VIP lounge! Use our exclusive bonus codes! Collect extra at the reels with our exclusive bonus codes! New players can use the code LORDNEW on your first deposit to collect extra £5 Free. Existing players can use the code LORDPLAYER your next £10 deposit to grab an extra 80% + 20 Free spins. VIP players can use LORDVIP on your next £20 deposit to unlock a massive 110% extra Bonus. You're only a click away from all the unstoppable bingo, slot game and jackpot action! So go on, see how much you can win this festive season!